Whether through infertility, medical reasons, or personal preference, choosing to adopt a child can be one of the best choices you can make in your life. On the other side, putting your child up for adoption can be seen as a selfless act of love where sacrifices are made for the best interests of the kid at the center of it all. 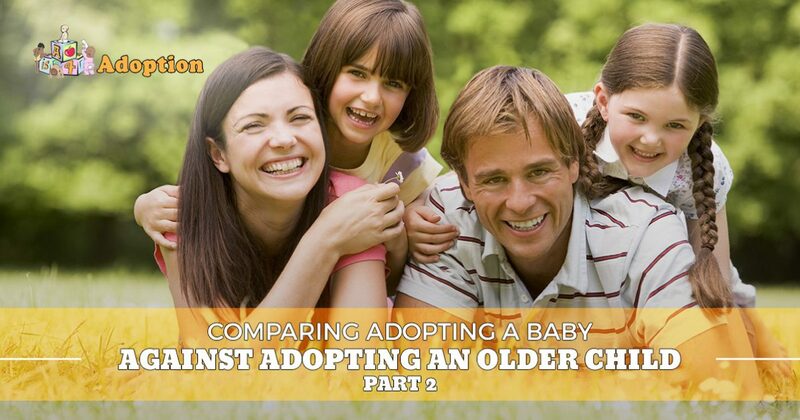 The age of the child that you adopt may have a major impact on the entire family experience. While adopting a baby is a popular choice, choosing to welcome an older child into your home can prove to be just as amazing. Today, our adoption center will continue to look at the benefits of each age group. A is 4 Adoption is here to help you through every stage of the adoption process. Unlike any adoption agency in California, our professional team is here to create a personalized plan that supports adoptive parents while providing comprehensive birth mother help. If you’re considering putting your child up for adoption, or if you’re thinking about growing your loving family, be sure to contact us today! Many people envision having their own miracle from birth. Raising a child from infancy is always the first plan, and one that can be accomplished with our adoption services. While adopting an older child can prove very beneficial, below are a few advantages that you can expect with a baby through private adoption. The parenting experience is hard to prepare for, and many parents joke about how they are “winging it” as they go. While amusing, this sentiment is fairly accurate for parenting. This task is one that’ll become easier as time goes on, imbuing you with the skills needed to be an amazing parent. Adopting an older child may leave some new parents unprepared, as they have skipped forward in the parenting process. Starting with an infant gives you and your significant other the ability to grow as your child does, keeping you one step ahead in the good parenting department. The science behind child development paints an unfortunate scene when a parent is able to bond with their offspring during the crucial early years of life. Secured attachments are essential for proper levels of bonding between parent and child, and being there during the formative stages will help greatly in this process. While you can bond with a child at any point in his or her life, the advantage of being there from the beginning is hard to beat. One issue that occurs for numerous families with older children is the integration of morals, values, and religious beliefs. While you may opt for an open structure for what your child believes in, certain behaviors and actions may warrant intervention. Adopting a baby means you’ll start with a “blank slate.” Otherwise, parents may be dealing with unwanted behaviors and attitudes. While adopting an older child can be an amazing experience, it’s important to know that a large number of adoptable kids across our country are dealing with medical and educational hindrances. Whether from biological or environmental influences, it can be a challenge for parents with older kids to keep them up to speed for their class and medication times. With a baby, you’ll be involved from the very start. Any struggles with learning should be addressed quickly for the best outcome, but you’ll be there to help every step of the way! The age at which you choose to adopt can play a major influence in your parenting experience. While older children help parents skip the baby years and often come with shorter wait times, the joys of adopting a baby can be hard to beat. Both approaches hold their unique advantages, yet the end result in either case is an amazing home for a child in need. A is 4 Adoption is proud to provide comprehensive birthmother and adoptive parent support to ensure the best outcome for the child. Unlike any adoption agency in California, our adoption center aims to deliver amazing results with a personalized approach. We’re confident that nobody provides as much care or nearly as amazing results as our experienced team. Contact us today to learn more about our adoption process!